Despite a record number of gymnasiums and health clubs popping up around the city, obesity for adults is at an all time high. In the seven-year span after the financial crisis of 2008, gyms openings across the five boroughs have increased by 125 percent and have yearly revenues of 955 million dollars. However, mostly New Yorkers that are already fit are getting easier access to exercise. The amount of gyms in the Upper East Side increased by 48 percent since 2008, adding 23 health clubs and gyms in the past seven years to its previous 55. The Upper East Side also ranks the highest in healthy places to live. Last month, the City released comprehensive health profiles for individual community districts and analyzed obesity rates, life expectancy and fitness. 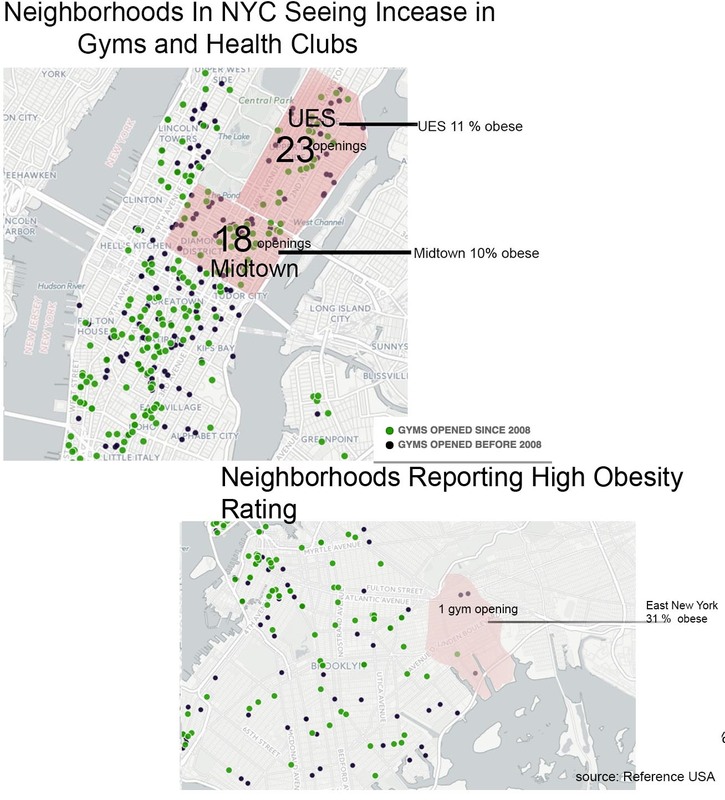 The reports indicates that 92 percent of residents in the Upper East Side rate their health as excellent and have an 11 percent obesity rate among it’s residents. This is not the case for the rest of New York City. The City averages that twenty-seven percent of its adult residents are obese. This is up from nine percent in 1990. “The Department [of Health] is having meetings to discuss this issues,” said Dr. Stracker. The main focus is improving areas that don’t typically have access to exercise. This is being done in part by constructing bike lanes and pushing for an increased number of free exercise classes at community centers. The neighborhoods of Clinton and Chelsea and Midtown report that 90 percent of its residents have exercised in the past thirty days, ranking the highest of any community districts. These residents enjoy easy access to Central Park, the West Side Highway running path and the highest concentration of gyms in the city. On the other end of the spectrum is East New York where 73 percent of residents say they had exercised in the past thirty days and report 31 percent of its residents as obese. Life expectancy for these residents is four years fewer than residents living in Clinton and Chelsea. Dramatic drop in the numbers of murders in the U.S.
Is There A Correlation Between One’s Commute Time and Their Happiness?